I thought nothing is more fabulous than macarons at the moment so that is what I bring to you. If you are a regular here, you know I am a macaron fanatic. It has become overwhelmingly popular over the last few years and pastry chefs, dessert lovers are not getting tire of it anytime soon. What not to love?! Pretty to look at and so delish! - On the backside of 2 parchment papers, trace 4cm circles about 4cm apart. Flip them over and line the baking sheets. - First, sift the almond powder twice first then add in the powdered sugar, and sift again. - Must let the piped cookies sit out until dry to touch, 20 – 30 minutes, before baking to prevent them from cracking during baking. 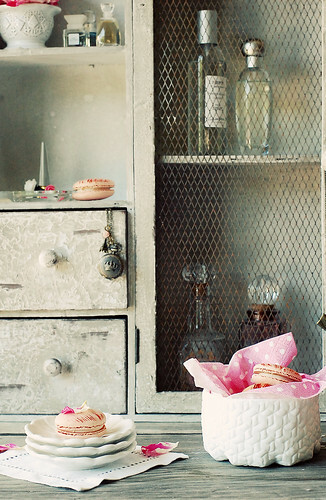 - Press the piping tip on the baking sheet when piping for uniformly shaped macarons. Do not suspend the tip in the air! 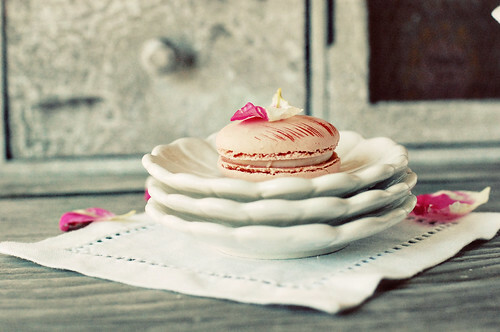 - It is best to consume the macarons within 3 days as it loses its moisture and becomes dry fast. Place the egg white in a clean mixing bowl, add in the red food coloring and rose essence then stir to mix. Add the almond flour mixture, using a rubber spatula, and fold until it forms into a sticky ball, cover with food wrap, set aside. Bring water and caster sugar over high heat to a boil and until it thickens and register at 230°F/118°C on a candy thermometer. While the syrup is heating, begin whisking the egg white at high speed in the bowl of a mixer using the whisk attachment, whisk until pale and foamy. Reduce the mixer speed to low speed and begin slowly (very slowly) pouring the syrup down the side of the bowl, being very careful not to splatter the syrup into the path of the whisk attachment. Some of the syrup will spin onto the sides of the bowl but don’t worry about this and don’t try to stir it into the mixture, as it will harden! Raise the speed to medium-high and continue beating until it becomes thick and satiny and the mixture is cool to the touch. When you lift the meringue with the whisk, it should form into a stiff peak. With a rubber spatula, fold the almond batter to the meringue and fold until completely incorporated. Now it is ready for the macaronnage process. With the rubber spatula, scoop and spread the batter, in a full circle, on the inside wall of the mixing bowl. Repeat this scoop & spread process, for a total of 15 times. Lift some batter with the spatula, it should falls into the bowl in a ribbon fashion, and should look glossy. Pour the batter into a piping bag with a small round tip and pipe the batter from the center of the drawn circle onto the baking sheets. Pipe about 48 circles. Let dry at room temperature for 30 minutes before baking to allow skins to form. Meanwhile, preheat oven to 300°F/150°C, with racks in upper and lower thirds. Once the batter is dry to the touch, place into the preheated oven and bake for 12 minutes. Remove from oven and transfer to cool on the cooling rack. Once cooled, slide a knife (fragile, must be careful) underneath the macarons to remove from the parchment paper. Cut the butter into 5mm thick squares, place in a heatproof container and heat in the microwave over medium heat for 10–15 seconds. Butter should be soft to touch but NOT melted. Using a rubber spatula, mash the butter until smooth and creamy (like the texture of mayonnaise), set aside. Bring water and caster sugar over high heat to a boil and until it thickens and register at 230°F/118°C on a candy thermometer. While the syrup is heating, begin whisking the egg yolk at high speed in the bowl of your mixer using the whisk attachment, whisk until pale yellow. Reduce the mixer speed to low and begin slowly (very slowly) pouring the syrup down the side of the bowl, being very careful not to splatter the syrup into the path of the whisk attachment. Some of the syrup will spin onto the sides of the bowl but don’t worry about this and don’t try to stir it into the mixture, as it will harden! Raise the speed to medium-high and continue beating until the egg batter thicken and cool to the touch. With the mixer on medium speed, begin adding in the butter. When all the butter has been incorporated, raise the mixer speed to high and beat until the buttercream is thick and shiny. Add the rose syrup, beat for an additional minute until incorporated. Refrigerate the buttercream for 10 minutes before piping. If stored in an airtight container, it will keep for 5 days and up to a month if frozen. Bring the cream back together before use. - Wait! My buttercream won’t come together! Reheat the buttercream briefly over simmering water for about 5 seconds, stirring with a wooden spoon. Be careful and do not overheat. The mixture will look broken with some liquid at the bottom of the bowl. Return the bowl to the mixer and whip on medium speed just until the cream comes back together. - Wait! My buttercream is too soft! Chill the buttercream in the refrigerator for about 10 minutes and rewhip. If that doesn’t work, cream an additional 2–4 tablespoons of butter in a small bowl– making sure the butter is not as soft as the original amount, so make sure is cool and smooth. On low speed, quickly add the creamed butter to the buttercream, 1 tablespoon at a time. Pair 2 macarons of similar size, pipe about 1 teaspoon of the buttercream filling onto the flat side of one of the macarons then sandwich them, repeat 23 times. 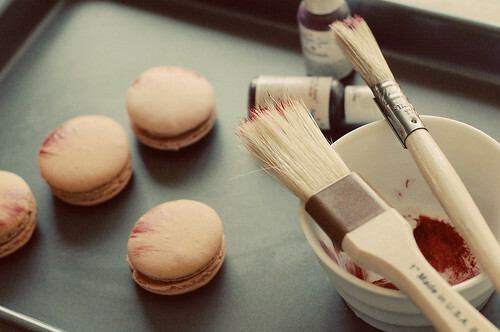 Drop a few drops of red food coloring on a clean plate, using a small pastry brush, dap slightly with brush tip and then brush it on smooth side of macaron, repeat 23 more times. Once dry, place in the refrigerator to set. It will keep for 3 days, if stored in the refrigerator and up to 4 weeks if frozen. Let stand at room temperature at least 20 minutes before eating. 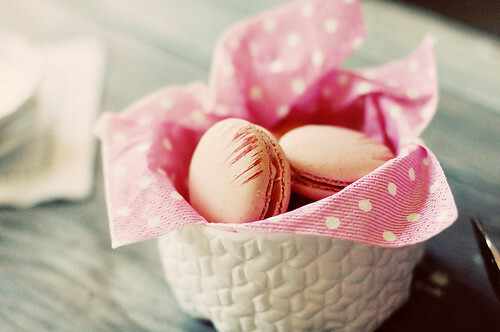 I like macaron, so cute. OMG! Wonderful! You live beautiful! Oh my God this looks so good and i`m sure that it is delicious too. I think it is not a very difficult recipe so i will give it a try, thanks a lot for sharing. 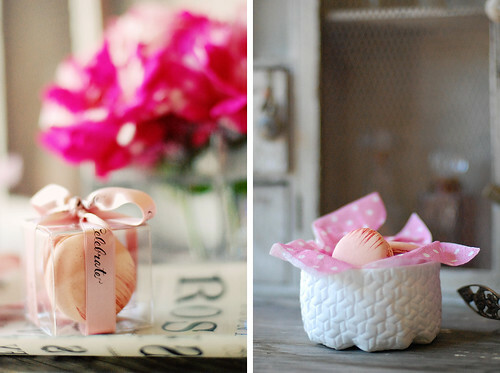 How incredibly beautiful and elegant, these would be absolute perfection for wedding favors! Thank You!! Nice post. Great blog. Thanks for the share. It was very interesting and informative. very nice post. love your photos, beautiful and creative. Speechless you have done great job here superb.i am really impressed by your this awesome work. I am planning on making these this week. However, I have a question about the rose essence. Can I use rose water instead? Thank you in advance!! I really want to try this recipe! Could you tell me where you get your almond flour, rose essence and syrup? I've tried looking in special food stores, but found nothing...and shipping is expensive for online orders. Thanks in advance! @Filip - How did it go? Hopefully it turned out beautiful & yummy! @whisperpuppies - Almond flour/powder/meal is available at the Whole Foods markets and Berkeley Bowl. 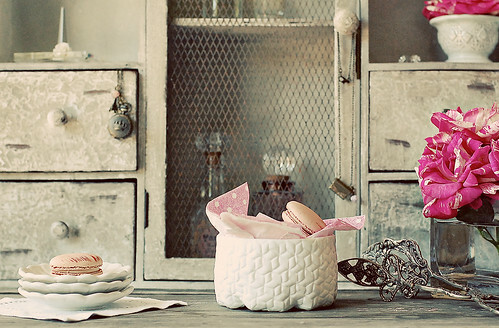 As for the essence, a good quality brand is Star White and it is available from sur la table stores. As for the rose syrup, I use Monin brand. It is hard to find but I saw a full inventory of Monin syrups at the Mimi's Cafe in Dublin. Great! I'm glad to hear that! Yes, macaron is sweet in nature since it is made using just sugar, egg whites and almond powder. Don't change the sugar amount in recipe but fill them with a tart filling so to counter balance the sweet shells. These seems to be wonderful! Your blog is really "appétissant"! Everything is charming and delicious. Love your photographs so much. Thank you for this perfect trip! Beautiful! The oddest thing happened to me 2 months ago regarding Rose macaroon's. The Whole Foods in Piccadilly Rose Macaroons destroyed the Laduree ones. I really didn't know what to do with that information after all the hype and excitement going into those situations. Regardless, it's a moot point now... 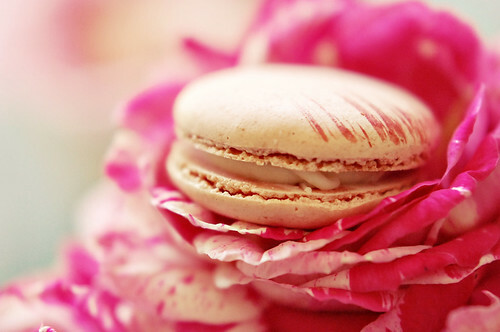 I live in Southern California and our next trip is to Asia so the next time I have a Rose Macaroon it will be your recipe. Thank you. Bless you. Enjoy your day!!! !